Danni showing Brett and Lata her birthday present: a piercing at the top of her right ear. Pam telling Doug that she thinks she should stay with Cody until after her exams. Danni asking Lou if he can shout her a trip to South Australia. Virkam catching Brett and Lata kissing. Vikram orders Brett out. Brett meekly gets up and leaves. When he's gone, Lata cries to Vikram that she and Brett *love* each other; it's not wrong for them to meet up. VIKRAM (angrily): Not wrong? You *lied* to me, Lata. You disobeyed me time and time again – but no more: you've had your chance. He storms out, leaving Lata looking worried. RICK: At least the murder-mystery party will take your mind off things – to which *I've* been invited. CODY: Who are you going as? RICK: I am going as the famous French artist, Georges Forgét. 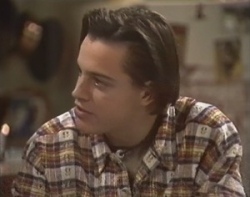 CODY: Then you've got a problem because I'm going as an art critic! REN: Save me, somebody! Have we got any camomile infusion? Danni is sitting in an armchair with her hand to her new piercing, looking slightly pained. Across on the sofa, Lou is telling Cheryl that the murder-mystery people say it's OK to take Louise with them. Cheryl asks him who's going bashing with him now that Phil's out. Lou smiles but then suggests that maybe Phil will change his mind: he's come out of himself a lot recently – and not before time either: he's got to learn to stand up for himself with Julie. The front door opens suddenly and Brett comes in, looking glum. CHERYL (sarcastically): What's put that smile on your face? BRETT (snaps): I don't want to talk about it. Brett heads to the kitchen area and Danni gets up and follows him. She asks what's up – and then guesses that it's Lata. BRETT (sighs): Vikram came home early. BRETT (indignantly): No, I wasn't! – but it's not funny: I'll probably never get to see her again. DANNI (whispers): That's what mum used to say about Michael and I, but that didn't stop us; you've just got to learn to be sneaky. BRETT: Does that still hurt? BRETT: You better get used to it: it's going to take months to heal. BRETT (mutters): You're crazy, you know? You should have got a ring through your nose while you're at it. DANNI: Yeah... I might just do that next time! DANNI (sarcastically): Yeah, right. No way! BRETT: You should show her – for her sake: it's probably infected. DANNI (snaps): It's not, Brett. BRETT (shrugs): Suit yourself – but if you get gangrene and we have to cut off your ear, then don't go blaming me! Brett walks off. Danni puts her hand to her piercing again and winces in pain. PAM: I just want to know he's got everything. CODY (muses): Where would we be without you, eh? Pam goes on sadly that she's been trying to work out how long it's been since she and Doug were apart for a few days. Cody tells her that she'll love every minute of Darwin once she's there. Pam puts her arms around her daughter and assures her that she won't be going until Cody's exams are safely over; they can't *both* nick off and leave her just when Cody needs them the most. Tears begin to well-up in her eyes. CODY: Mum... why don't you just go to Darwin with dad? PAM: I can't leave you on your own. CODY: What if I board somewhere? CODY: I don't know. Someone'll take me in. PAM: This is your home, Cody; I'm not throwing you out. You just do well in your exams and then you can board wherever you want – or come to Darwin. They hug again. Doug arrives home and smiles at Pam for having dug out his suitcase. He then explains that he's been doing the rounds of the truck depots to see if he can find someone to share the trip up; there's nothing yet, but he put an ad on their noticeboards. Pam tells him to check them out carefully. Doug nods in amusement! CHERYL: My little baby! I just blink and you're 18! LOU: So how does it feel? LOU: To be able to vote, drive and join the army. DANNI: It feels great; just great! Lou then asks what Brett bought her. Danni tips something out of a small pouch and shows him an ear stud. LOU: Where's the other one?! CHERYL: You'll look a bit weird with one earring, won't you? LOU: It's all the rage; didn't you know?! Cheryl then holds out an envelope to Danni and tells her that good things come in little packages! Danni opens the envelope to reveal an airline ticket. DANNI (gasps excitedly): Oh what?! LOU: Michael can't come to you, so we're sending you to Michael. Danni leaps up and kisses both Cheryl and Lou happily. There's suddenly a knock on the front door and Lou goes to get it. He comes back a few seconds later with Marlene, who asks Danni if she's ready. CHERYL (suspiciously): Where are you off to? With that, Marlene and Danni head out. Brett sits down at a table with Lata and asks what Vikram said. BRETT: That's *something*. Maybe he's getting the message? BRETT: Well it's about time he did. He has no right to interfere; it's got nothing to do with him. Brett stands up again and says he's going to go and see Vikram. Lata, however, cries that it's too late. LATA: It's all over: he'll never let me see you again. LATA: He's sending me away. BRETT (looking horrified): He can't! LATA: Yes he can. He's sending me to live with my Aunt Rupa, interstate. Danni is standing holding a ‘P' plate on top of her head! Lou and Cheryl are staring and Lou exclaims that they had no idea this was happening! 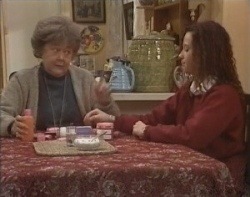 DANNI (beams): When nan gives secret lessons, she gives secret lessons! MARLENE: Just my little birthday gesture! Lou tells Marlene that she's a brave lady! Danni, however, insists indignantly that she passed her test very easily! Cody suddenly runs in and gives Danni a hug. Marlene then tells Cody that she found some more make-up lying around, and she asks Cody if she wants it. Cody nods that she does. The two of them head out. Lou asks Danni if she's going to take him for a drive. Turning to Cheryl, he asks her to make sure his life insurance is paid up! VIKRAM: It's not your business. BRETT: It's *Lata's* business; that makes it *mine*. VIKRAM: I've made my decision. BRETT: You can't just send her away like that. For starters, she doesn't even want to go. VIKRAM: We *often* don't want what is best for us. BRETT: But it's *not* best for her; can't you see that? Vikram retorts that it's not for Brett to decide. Brett snaps that it's not for Vikram to decide, either; she's not a kid. Vikram, however, tells him that, in a way, she *is* - and until she proves she's an adult, *he* must take personal responsibility. BRETT: But you're hurting her – or doesn't that matter to you? VIKRAM: *Hurting* her? Am I teaching her to lie? Is it me who instructs her in the art of starting brawls between men? Is it me who's leading her astray? BRETT: No, but it's you who's taking her away from the people who love her. VIKRAM: ‘The people who love her'? How old are you? BRETT: I'm old enough. I'm old enough to know how I feel – and so is Lata. VIKRAM: Lata needs discipline. She needs to learn responsibility. I've not been able to teach it to her. Perhaps her Aunt will do a better job. MARLENE: I'm giving up all initiative and becoming a staid old granny! CODY (laughs): You couldn't stand it! MARLENE: Uh-uh – bric-a-brac shop! Looking thoughtful, Marlene then muses that maybe she *should* channel her energies in that direction. She asks what she should call it. Cody, however, is staring into space. MARLENE: Away with the fairies, were we? CODY: Yeah, something like that. MARLENE: Thinking of your sister? Marlene points out that at least Pam will be there while Cody's doing her exams. Cody sighs that she doesn't think it's fair on her mum; she doesn't *need* her there; it feels selfish. CHERYL: *This* should keep him warm on those chilly Outback nights on the road! Pam goes on that she knows it's stupid, but she's missing Doug already and he hasn't even gone yet. Cheryl insists that Pam should go with him; she and Lou can look after Cody for her. PAM: That's very sweet of you, but these are her Year 12 exams, and if she can't rely on her mother, who *can* she rely on? Cheryl says *she* feels exactly the same way about Louise even at *her* age, but she's not there for *her*. PAM (looking surprised): Course you are. CHERYL: No I'm not. She needs a mother that's at home, looking after her, giving her warm bottles. Instead, I'm here serving cold beers. Pam tells her that Louise is in good hands; she won't turn out all bitter and twisted just because Cheryl wasn't there for her every second of her life. Cody and Marlene are staring through a shop window from the outside. Marlene is commenting that it's big enough, and there are nice high ceilings to hang things from. Cody asks if she's interested. MARLENE: Yeah. I could be! Cody is sitting in the kitchen eating pizza with Rick, who asks if Marlene is going to go ahead with the shop. Cody nods that she thinks so; it would be great if she did. RICK: At least it's put a smile on your face. Cody then tells Rick that she needs somewhere to board so her mum doesn't feel like she has to stay behind. RICK: Why don't you board here? It's not a problem. CODY: There's no spare bedrooms. CODY: I'm supposed to be studying, remember?! CODY: What's Cheryl done now? REN: She's given me the afternoon off. RICK (laughs): Man, that's terrible! REN: No, no. I just want to do my job, OK, but Cheryl comes home early because she can't stand to be away from the baby. It's not normal. Brett is lying on the couch, staring into space, when the front door opens and Lou comes in, whistling. He looks at Brett, who turns away from him. LOU: Do you want to tell your old semi-dad what ails you? Promise I won't breathe a word. LOU: You know, when blokes are on a downer like this, it's usually something to do with women, work or money. BRETT (sits up): It's Lata. LOU: Oh... She given you the boot, mate? BRETT: No, Vikram's given *her* the boot. Brett explains about Vikram sending Lata away. Lou asks what he and Lata have been up to. Brett insists that they haven't done anything. Lou says he's sure Vikram wouldn't be doing this unless it was in Lata's best interests. BRETT (snaps): I don't care what Vikram thinks – or anyone else. I just know how I feel and how Lata feels, and sending her away sure seems wrong to me. Doug wraps the blanket that Pam bought for him around himself and smiles that he'll treasure it. Pam sighs that she hopes it's not going to be too lonely without her. Doug insists that it won't be for long. DOUG: Don't you want to go? PAM: Yeah, of course I do – it's going to be wonderful. I just hate saying goodbye to these four walls. I'll *miss* this place, Doug. PAM: I just wish we could take them all with us, you know? DOUG: We can take the memories – and there've been plenty of *those*. The two of them stand in the middle of the lounge room, wistfully. Danni opens the door to Lata, who's holding a pink and white bird on her hand. DANNI: Now there are *two*birdbrains in the family! 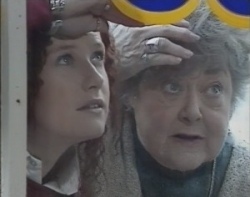 Cheryl suggests pointedly to Danni that she give her a hand upstairs with Louise. The two of them head off, leaving Lata alone with Brett. 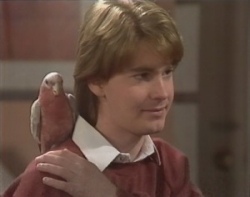 BRETT (indicating the bird): Was this the one in the Erinsborough Pet Shop? BRETT: I went to see him this morning and he'd gone. LATA: I knew you had your eye on him. He's a goodbye present... I don't want you to forget me, Brett. Brett takes Lata's hands and asks her when she leaves. LATA: Now. The flight's this evening. BRETT: I'll write to you. LATA: I'll write to you, too, every single day. You let me know how the galah's getting on. BRETT: I'm going to have to think of a name. BRETT: I will – for sure. BRETT: You'll probably meet somebody else up there. 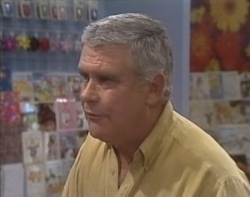 Lou is at the newsagency, talking to Vikram, who tells him curtly that he's wasting his time. LOU: Come on, mate... All I'm asking is you give them a fair go. Vikram retorts that Lata's already had more chances than she deserves; he's sorry about the hurt it's causing her and Brett, but there are more important things to take into consideration. VIKRAM: Lata's welfare. Her future. LOU: You think Brett's going to destroy her future? VIKRAM: Lata needs discipline; she needs more authority than I seem to be able to give her. You're going to let her run wild so as not to upset Brett? LOU: I wouldn't say she's actually running wild, either. VIKRAM: Mr. Carpenter, Lata is so very young; so is Brett; they'll get over this. VIKRAM (tersely): I know how they're feeling now, but I must do as I see fit. They will both understand when they're older. Lou stands there, looking annoyed. Danni opens the front door and Cody comes in with a present. Danni opens it to reveal a CD. DANNI: ‘Bacon Grind'! Unreal! Thank you! She gives Cody a hug. Cody then asks where Brett is. Cheryl calls across from the couch that he's with Lata. Danni adds that it's the ‘heavy goodbye' scene. She then asks Cody if Marlene caught up with her. Cody says she didn't, and she asks if Marlene said what she wanted. Danni replies that she didn't, but it sounded important. CODY: I bet you she's rented that Bric-thing shop. With that, Cody dashes off. 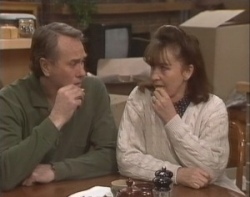 Cody and Marlene come in through the front door as Doug and Pam fill boxes with Doug's belongings. Cody laughs that it looks like a bombsite in there. DOUG: If there's anything else, I don't want to know about it! CODY (to Pam): Where's *your* stuff? PAM: It's a bit early for me to be packing. DOUG (suspiciously): What are you on about? MARLENE (smiles): I think Cody's got something to tell you both! CODY: Mum, how would you like to go to Darwin with dad instead of waiting round here with me? PAM (sighs): Oh come on, Code, we've been through all that. Marlene, however, tells her to hang on and listen. CODY: I think you should pack your bags because I've found a quiet, nice, comfortable place to board during my exams. It's perfect. 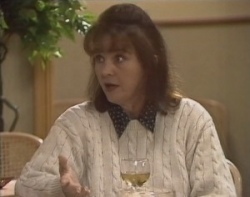 MARLENE: Well, it's not perfect, but it's entirely suitable. CODY (announces): I'm going to board with Marlene. Doug and Pam look at each other with bemused expressions on their faces!